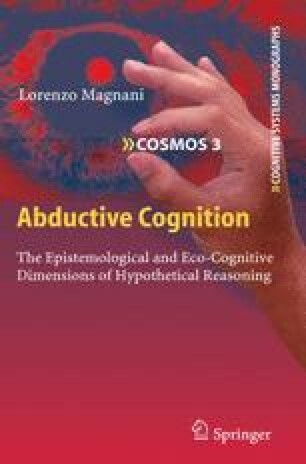 In chapter one I have illustrated the basic distinction between theoretical and manipulative abduction and the other main features of abductive cognition. Further important cognitive and logico-epistemological considerations have to be added. First of all the fact that abduction is a procedure in which something that lacks classical explanatory epistemic virtue can be accepted because it has virtue of another kind: [Gabbay and Woods, 2005] contend that abduction presents an ignorance preserving (but also an ignorance mitigating) character. From this perspective abductive reasoning is a response to an ignorance-problem; through abduction the basic ignorance – that does not have to be considered a total “ignorance” – is neither solved nor left intact. Abductive reasoning is an ignorance-preserving accommodation of the problem at hand.